Despite the difficulties in marriage and family life, Pope Francis invites us to consider the beauty of marriage in his homily at the morning Mass at the Casa Santa Marta. 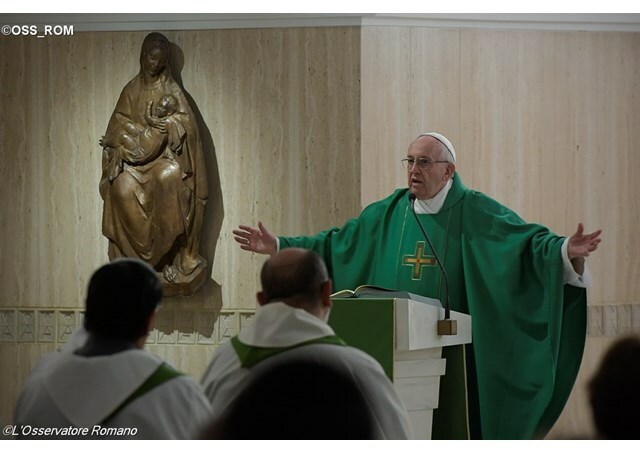 Pope Francis spoke about the beauty of marriage in his homily at the Casa Santa Marta on Friday. Among the faithful present at the morning Mass were seven married couples celebrating their 25 wedding anniversaries. The question posed by the Pharisees concerned marriage; they wanted to know if it was lawful for a husband to divorce his wife. But, said Pope Francis, Jesus goes beyond the simple question of lawfulness, going back to the “the beginning.” Jesus speaks about marriage as it is in itself, perhaps the greatest thing created by God in those seven days of Creation. We must not focus, like these doctors do, on [the answer] "Yes, you can" divide a marriage, or "No, you can’t." At times there is misfortune, when it doesn't work, and it is better to separate in order to avoid a world war. But this is a misfortune. Let us go and look at the positive. It’s true that there are difficulties, there are problems with children or with the couple themselves, arguments and fights… but the important thing is that the flesh remains one, and you can overcome, you can overcome, you can overcome. And this is not only a sacrament for them, but also for the Church, a sacrament, as it were, that attracts attention: “See, love is possible!” And love is capable of allowing you to live your whole life “in love”: in joy and in sorrow, with the problems of children, and their own problems… but always going forward. In sickness and in health, but always going forward. This is beautiful. It’s sad when this is not news: the newspapers, the TV news shows, don’t consider this news. But this couple, together for so many years… it’s not news. Scandal, divorce, separation – these are considered newsworthy. (Although at times its necessary to separate, as I said, to avoid a greater evil). The image of God isn’t news. But this is the beauty of marriage. They [the couple] are the image and likeness of God. And this is our news, the Christian news.